Charlotte Ann Brown Hodges, age 82, a Chattanooga native, and resident of Ringgold, Ga, passed away peacefully in her sleep and went to be with her Lord on Wednesday March 20, 2019. She graduated from Chattanooga Central High School and worked for years as a bank teller in area banks, and retired from Suntrust Bank. She was a Hixson resident for many years. She worked as a volunteer when the North River Civic Center in Hixson first opened, and received the Volunteer of the Year award from them in 2007 for countless hours of volunteer service. She was also a decorator. She was a member of East Ridge Baptist Church in her youth, of First-Centenary United Methodist as an adult, and finally Boynton Baptist Church of Ringgold, Ga. She was a very giving, generous person in her lifetime, always helping people or matching donors with people in need. She loved gardening, the Braves, the Vols, gospel music, nature and animals. She was preceded in death by her parents, Lawrence P. Brown and Leona Smartt Poe, both of Chattanooga. 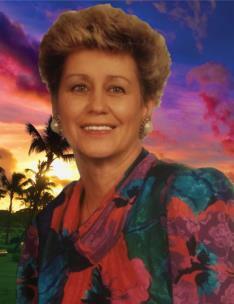 Her husband and best friend for many years, Gene Gore. She is survived by her sister, Sandra E. Rathjen, of Hixson, daughter, Kelly McGee Davis, of Palm Beach Co., FL, and son, Marty McGee of Ringgold, GA. grandsons, Christopher Blevins of Ringgold, Will McGee of Ringgold, Josh McGee of Marietta, GA, and a granddaughter, Katie Sullivan of Ringgold. A nephew, Michael Tatum of North Chattanooga, one great-grandson, and three great-granddaughters. She was very loved. Her warmth, generosity, love for friends and family, and outstanding wit will be sadly missed. Her remains will be laid to rest at the Lomenacque Cemetery in East Ridge next to her beloved mother, Leona. A graveside service will be held Saturday, April 20, at 1 p.m in East. Ridge at Lomenecque Cemetery with Pastor Keith McLeod of Boynton Baptist Church of Ringgold officiating. A Celebration of Life will be held immediately after at a location to be announced at the service.